One evening last week, I finally met Eric. My dear friend Sharon, who showed up on this website before Danny did, has been dating a man for nearly two years without me meeting him. This is not acceptable. It happens  life works this way. But still. Nearly 2 years. To be fair, they met in a teaching program in Ashland, Oregon, a town too far away for a day’s drive, particularly with a little kid. Sharon and I have been friends for nearly 30 years (30 YEARS! ), but sometimes distance keeps us apart from each other for awhile. And when the possibility of meeting Eric was almost ready to happen, he made the decision to move to China. China. Eric has been teaching English in China for the past year. Sharon pined for him. He missed her terribly. They talked via Skype all the time. Sharon visited him for three weeks in the middle of winter. She and I talked about it all the time. They made it through the year intact, the two of them. He’s back, for just a bit. One of the first things they did together? They drove up to see us. They drove up on a sunny afternoon, just as Lu was flinging herself on the slip and slide again. Water splashing, sunlight, giggles  this is a pretty good way to walk into our world. And there was Sharon. It’s amazing how quickly (hint: 2.3 seconds) Sharon and I are all the ages we have ever been with each other, laughing. Eric walked up for a hug. He was welcomed. There was easy laughter in the midst of the understanding of how momentous and strange this was. We watched Lu play as we talked of this and that. Lu was slow to warm to Eric. She has adored Sharon from the moment they met  just like her mama  and she’s used to having Sharon focus solely on her during those visits. Who was this guy with his arm around Sharon? Why was she staring at him instead of Lu? But I knew she approved of him when she ran up and down the stairs in a different dress-up outfit each time, then landed on the deck with a big ta-da! She looked for his approval every time. 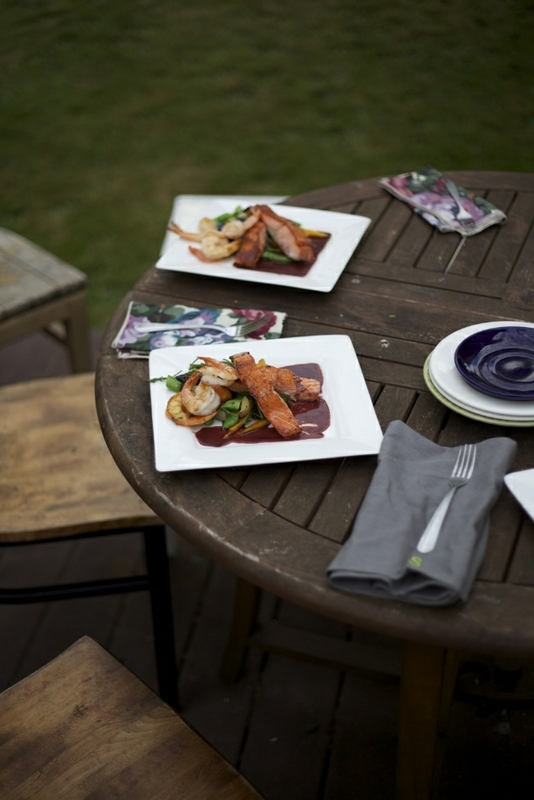 We sat down to dinner in the warm evening air outside. When I talked to Sharon about what we should eat, she said that Eric had been missing fresh food after a year in China. (We decided to not make a stir-fry for him.) Anything local, in season, lots of fruits and vegetables. I took the longest to acknowledge what I knew within the first few moments of meeting him. Eric’s a thoughtful, funny, sensitive man. He dotes on Sharon and teases her in all the right ways. He and I had a really interesting conversation about his observations of China, how fast the culture moves on brute manpower, and everything he had noticed. In a different circumstance, I would have said immediately, “Oh, this guy’s a good egg.” I mean, I knew he was. But was he good enough for Sharon? It was long after Lu was in bed that it happened. Sharon brought out a present I had made her years ago, a framed art piece called What Will Always Be Sharon to Me. I thought of every phrase, song, silly reference, Saturday Night Live character, and shared experience between us and made a list. Along the sides, I illustrated it with photos of the two of us from the time we were in high school until we were almost into our 40s. (I’m so glad this present exists but it proved once again that I really stink at crafts.) We sat down together on the couch to look at it, Danny and Eric sitting across from us. There’s this thing that happens between me and Sharon. It doesn’t happen with anyone else in my life. We include other people in our conversations, naturally. But when we get going, reminiscing, we splutter into laughter and a shared language that no one else could possibly understand. All it takes is “Do you remember…” “yes! yes!” “and that thing?” “And that guy?” And we’re off. We’re howling, tears rolling down our faces, leaning into each other, shoulders touching, unable to complete a sentence. We scream a little. We shake. We laugh so hard that our voices become squeaks, then silence. We don’t intend to do it. We don’t mean to make anyone else feel left out. We enter into this physical space where everything else stops. And it’s just the two of us, 17 and 15, 26 and 24, 32 and 30, 38 and 36, right now, all of those ages, and every age we will ever be friends together. Forever. I saw Danny lean over to Eric and say, “I’ve seen this many times before. You’ll get used to it.” And Eric smiled, happy to see us loving our time together. A few times, this happened with the wrong guy there. I dated a man who sat at a restaurant table while this happened and huffed that he couldn’t understand us. Sharon dated a guy who seemed ready to storm out that he wasn’t the center of attention. Most of the men we have dated just didn’t get it. Only one man before this sat there and laughed, not needing to understand, not asking what we were talking about, but smiling at the connection between us. That was Danny. And that evening, it was Eric. That was it. I approve. The brief visit was a sweet hello. It was also a tremulous goodbye. Or, as Danny insists we say, See you later. You see, in a few weeks, Sharon is getting onto a plane with Eric. She’s going to China with him, to teach English alongside him, for a year. An entire year. In China. I’m going to learn how to use Skype. Facebook updates seem more important now. I’m going to teach her how to use her camera and send me photos. We’ll get through this year. That shared meal and laughter may be the last time I see Sharon until next August. Eric, we adore you here. But you better take care of my girl. Danny introduced me to hash. Wait, that sounds funny, doesn’t it? I don’t mean that hash. I mean the lovely assemblage of fresh vegetables, diced potatoes, and whatever is left in the refrigerator to make up what you see above. Usually, hash is a great way to use up leftovers  a handful of roasted potatoes, the last of the vegetables left from the farmers’ market, a few tosses of sliced ham or sausages. We have something like this for breakfast a few times a week, with scrambled eggs for Lu and oozy poached eggs for me and Danny. That’s always a big sigh of a breakfast for us. But when you start fresh, with vegetables consciously chosen to go together? Something magic happens. Boiling the potatoes. Put the diced potatoes in a big pot of salted cold water. Bring the water to a boil and cook the potatoes until a sharp knife pierces through a potato easily, about 15 minutes. Drain the potatoes of their water and set aside. Sauteeing the vegetables. Set a large skillet over medium-high heat. When the skillet is hot, pour in 1/4 cup of the olive oil. Add the onion and garlic. Cook, stirring frequently to avoid burning the garlic, until the onion is soft and translucent, about 7 minutes. Add the fresh rosemary and cook until the scent of the rosemary hits your nose, about 1 minute. Add the carrots and porcinis to the skillet. Cook, stirring occasionally, until the carrots and vegetables are softened, about 5 minutes. Add the snap peas and sea beans. Cook for 1 minute and no more. Move the vegetables to a plate to cool. Frying the potatoes. Pour the remaining olive oil into the skillet. When it is hot, add the drained potatoes. Fry the potatoes, stirring occasionally, until they are crisp, 5 to 7 minutes. Finishing the hash. Add the cooked vegetables to the potatoes. Toss around the skillet until the flavors have mingled, about 2 minutes. Add the parsley and toss. Lovely. Perfect. I want to eat it off the screen. Great story, too. I am glad he’s a really good guy. 🙂 I’m also wondering if sea beans are also known as pickle weed? It looks so much like it. Awesome post! 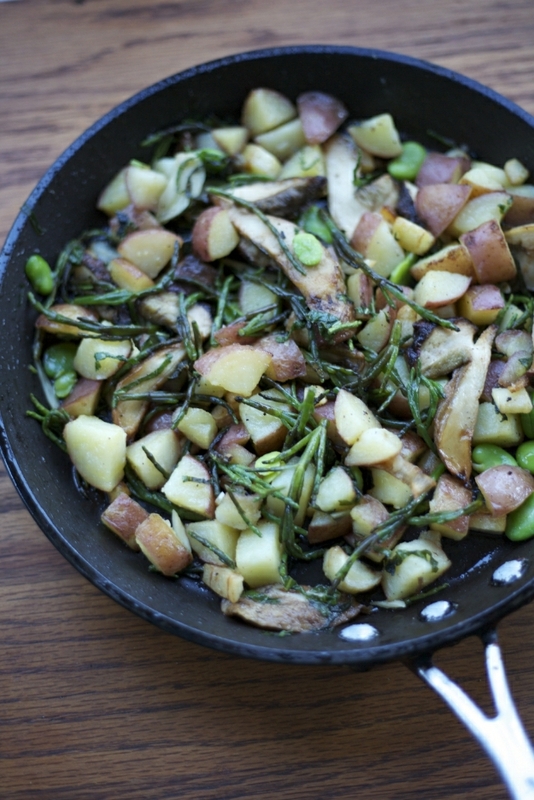 sounds very healthy summer vegetable hash, perfect article. I keep on reading article like this. Thanks for the info! We had this for breakfast this morning (minus the salmon) but with muffins. A really yummy recipe especially for me who has become gluten free. Thank you. With today’s technology, it’s easy to keep up with friends and family overseas. My daughters recently came back from 2 months in Europe (I know it’s less than a year, but still. :), and we used a great smartphone app, Viper. Similar to Skype, but on the phone. It was a wonderful to know they were fine and I could talk to them, free!! Your potatoes look great. I love the rosemary idea, and with a bush of it in my backyard, I’ll definitely be using it soon. Lovely, lovely. So glad you got to have the time together. I just spent several hours Sunday evening talking to my best friend of 34 years. We haven’t seen each other for a couple of years, so I can relate. I’m not looking forward to my kids going off to college, but it WILL free me from the public school calendar & make it easier to visit friends who are bound by their own school calendars that, of course, do not line up with mine! And I’m so glad Lu approved of Eric, because perceptive children KNOW who is ok & who is not. Oh darling, it will be ok! My BFF just left for Seoul… again. This will be her third year teaching there. Husband and I visited for 10 days last fall and it was marvelous. She comes home at Christmas and during the summer and we relish every moment. Skype is amazing but beware the time difference. It makes meeting up difficult. She’ll always be a world-traveler and we’ll always be farmers. And some day when she ends up in Barcelona to teach at her dream school, we’ll go visit her there as well. I’m waiting for her Eric too. The others haven’t measured up so far. And if I have to fly around the world to meet him I will. It’s definitely see you later, never goodbye. ugh. This made me pine for my best friend in Florida. I miss her so. Oddly enough I’ve been missing her calls over the last month, just too busy to pick up. And this made me call her 10 times in a row. And your hash is gorgy. Tell us about the sauce with the salmon and shrimp version, too. It makes the plate look so scrumptious! Sorry, I meant to say please! Subscribing by email now to keep up! correctly. Has the new book gone to press yet? download the Kindle Editions when we get the funds! Meantime thanks for the lovely stories, and of course the gf recipes! At first I thought “sea beans” was a typo, but then you repeated it in the recipe! From the picture, I think it’s what we in the UK call samphire. So delicious. If other UK readers are looking for it, you can sometimes get it (only at this time of year) from http://www.riverford.co.uk, or from fishmongers. Make sure you get marsh samphire, though – apparently rock samphire is horrible. You won’t even know she’s gone with Skype! Better yet, you could go to China for a visit. O.K. probably not in the cards. I have two friends I have known since I was 4 years old, soul mates really. There is anything like being with people who know you, who know where you came from, where you have been and where you are headed. We all have good friends, intimate friends but these kind, the kind like Sharon, the kind we love more than life itself, we only get one or two in lifetime so keep them close. Thanks for the wonderful presentation last night at Book Larder. My daughter and I really enjoyed it! I could listen to your stories for hours, and it was so sweet of you to give the one gal a big hug around the time the hash was being served up. Next project is to buy some GF buckwheat groats to make crepes. Can’t wait! Take good care and thanks again! I just read this at work and totally cried my eyes out. Thanks for describing perfectly the relationships between our best friends. As always, your writing moves me. Oh yeah, that dinner looks pretty delicious too. This looks amazing! It looks like it would be good at any meal. Can’t wait to try it! it is TOTALLY the hot sauce on the dinner I’m eating right now, as I read this, that’s making me sniffle. Seriously. I swear. I have a friend like that. 🙂 Love this. I have been following ” the girl”, and now “the chef”. It is so awesome what you are doing together. There is this certain electricity with your work and life right now …you are having fun….enjoying you from afar. If I ever get to Vashon! I have a large number of dried spices (my mum buys them and then gets tired of them. Would they work as well as the fresh ones? And if not, can you recommend a store that sells the best fesh spices? Thanks! That sauce looks so good! (and everything else as well) You’re a lucky girl to have such a dear friend. I’m sure you’ll get through the year apart. Think how it would have been 40 years ago! Today you have the internet. So easy to stay in contact with each other. I love hash. It always reminds me of my Grandmother. She used to make corn beefed hash that would knock your socks off. She gave me the recipe but I’ve never been able to reproduce it like she made it. This sounds delicious. Do you know what would go really well on top of that? A poached egg.